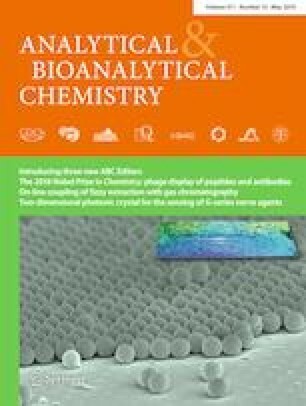 Quantification of ultra-trace analytes in complex biological samples using micro-solid-phase extraction followed by direct detection with internal extractive electrospray ionization mass spectrometry (μSPE–iEESI–MS) was demonstrated. 1-Hydroxypyrene (1-OHP) and papaverine at attomole levels in human raw urine samples were analyzed under negative and positive ion detection mode, respectively. The μSPE was simply prepared by packing a disposable syringe filter with octadecyl carbon chain (C18)-bonded micro silica particles, which were then treated as the “bulk sample” after the analytes were efficiently enriched by the C18 particles. Under the optimized experimental conditions, the analytes were readily eluted by isopropanol/water (80/20, V/V) at a high voltage of ± 4.0 kV, producing analyte ions under ambient conditions. The limit of detection (LOD) was 0.02 pg/L (9.2 amol) for 1-hydroxypyrene and 0.02 pg/L (5.9 amol) for papaverine. The acceptable linearity (R2 > 0.99), signal stability (RSD ≤ 10.7%), spike recoveries (91–95%), and comparable results for real urine samples were also achieved, opening up possibilities for quantitative analysis of trace compounds (at attomole levels) in complex bio-samples. The online version of this article ( https://doi.org/10.1007/s00216-019-01794-2) contains supplementary material, which is available to authorized users. This work was supported by the National Natural Science Foundation of China (No. 21605016, 21705017), International Science & Technology Cooperation Program of China (No. 2015DFA40290), and Program for Changjiang Scholars and Innovative Research Team in University (PCSIRT) (No. IRT_17R20). All procedures performed in this work involving human participants were in accordance with the ethical standards of the research committee of East China University of Technology and with the 1964 Helsinki declaration and its later amendments or comparable ethical standards. Informed consent was obtained from all individual participants from the local Bureau of Drug Abuse Control (BDAC) included in the study. Chen H, Venter A, Cooks RG (2006) Extractive electrospray ionization for direct analysis of undiluted urine, milk and other complex mixtures without sample preparation. Chem Commun 2042–2044. https://doi.org/10.1039/b602614a.